Unlike the metropole, none of the colonial powers in Africa operated a centrally organized propaganda machine during the war. Inside the various colonies, local efforts thus consisted of a mixture of private and official ventures that initially relied heavily on imported European imagery. Meanwhile, Africans and Africa-related themes began appearing in metropolitan propaganda campaigns only after the British and French deployed colonial soldiers on the Western Front. These images, intended for a western audience, soon filtered back to the colonies, where they were augmented by propaganda aimed at enticing African populations to support the war effort via enlistment and donations to war funds. African elites soon initiated their own domestic pro-war propaganda campaign in an effort to promote their own political agendas. African theaters routinely get short shrift in studies of the Great War. This gap extends to studies of wartime propaganda. While historians have examined metropolitan propaganda machines and their efforts to manipulate neutral powers and domestic public opinion, to date there are no systematic studies of how propaganda was used to sell the “White Man’s War” in Africa. Clearly designed to sway western audiences, the work of Britain’s Wellington House and Ministry of Information, the French Bureau de la Presse and the General Staff’s Office of Information and Propaganda, and Germany’s Zentralstelle für Heimatdienst was exported to the colonies, where it helped shape local attitudes towards the Great War. In time, these efforts came to include African-related themes and competing visions of African soldiers as part of a campaign to solicit recruits and drum up support for the war effort amongst colonized peoples. Official British, French, and German propaganda efforts initially focused on advancing the argument that they were each victims of foreign aggression or had been provoked into war and were thus only defending themselves. Each side also began indulging in atrocity propaganda to portray the enemy as inhumane, whilst linking their own participation in the war to efforts to defend the weak. Since the bulk of early propaganda was either verbal or written rather than visual, this led to an explosion of pamphlets about alleged atrocities, the evils of the enemy’s culture, and national caricatures. The most infamous example of these efforts was the “Report of the Committee on Alleged German Outrages” (aka the Bryce Report), which discussed supposed atrocities committed by invading German forces in Belgium. These included claims that they had raped nuns, killed children, and resorted to the use of forced labor. In short order, these atrocity stories expanded to include allegations about the supposed barbarity of colonial forces and outrages committed by both sides on the African continent. While war news and its related atrocity imagery was exported to Africa via cable and the metropolitan press, the reaction of African newspapers to the outbreak of hostilities was decidedly mixed. In South Africa, the local press initially suppressed some war news and depictions of the Germans as evil, rapacious Huns bent on destruction because local authorities did not want to exacerbate tensions between English and Boer settlers. Similarly, in Kenya, the East African Standard spent the first few months of the war proclaiming the need to keep peace in the colonies lest it encourage Africans to seize the opportunity to revolt. The press in British and French West Africa, on the other hand, was more willing to run the usual metropolitan atrocity stories about Germans bayoneting babies, destroying cathedrals, and executing civilians. After the Anglo-French invasions of Togo and Cameroon, this was supplemented with stories outlining German history, replete with the Hun metaphor and the supposed German blood lust and appetite for destruction. Perhaps more pertinently, West African newspapers condemned German colonial policies as exploitative and unnecessarily harsh, making the case that an Entente victory stood for humanity and humane principals, whereas a German victory would lead only to savagery and brutality. The West African press also made the case for imperial unity and the possibility of post-war changes to compensate Africans for their good will and sacrifices in the form of enlistments and donations to war relief funds. These messages were passed on to the public at large by clergy and local politicians in schools, sermons, political speeches, and editorials. Meanwhile, Rhodesians, hoping that the war and the campaign for Irish Home Rule might affect their own status, began preparing to join Britain’s war effort. To that end, the Rhodesia Herald and Bulawayo Chronicle not only ran pro-war articles, but also spread the stereotype of the murderous Hun via editorials and letters to the editor from self-appointed German-haters. Once Rhodesian forces went to war, the local press colluded in distorting images of the conflict by overselling news of Entente victories and suppressing damaging stories about their own setbacks. The extent of propaganda in Africa increased as the war dragged on and both sides sought to recruit soldiers. In South Africa, the decision to take part in the invasion of neighboring German Southwest Africa helped trigger a brief Boer rebellion in October 1914. Thereafter, the local South African press engaged in a mix of propaganda and electioneering to generate support for both the war effort and the government at the Cape. Nevertheless, South African journalists were still wary of stirring up local political factions, lest the resultant divisions split the country and open the door to uprisings by the colored populations. As a result, the press made a conscious choice to downplay or ignore events in Africa, focusing instead on news from the metropole and how the war might affect the South African economy. The local press also colluded in propaganda campaigns to induce white South Africans to enlist for service on the Western Front or the East Africa campaign. To that end, newspapers like the Matabaele Mail began describing the Germans in East Africa as a barbarian horde and invoked the prospect of a race war via claims that the German governor had issued a call for jihad against Christians. Lest that not be enough to encourage white South Africans to enlist, the Mail also joined other South African newspapers in running articles repeating atrocity stories from Europe and infused with patriotic imagery that emphasized duty, manhood, imperial unity, and the heroic deeds of Canadian and ANZAC troops. In Southern Rhodesia, the press indulged in similar propaganda efforts due in large part to their participation in the East African campaign. As a result, Rhodesian journalists not only glorified the concept of imperial unity and insisted on the need to assist Britain with men and supplies, but also began arguing that the Germans were sinister, evil, and murderous. In addition to printing stories about alleged atrocities in Europe, they also began fabricating new ones, later debunked, that the Germans in East Africa made use of cruel weapons like saw-toothed bayonets and dum dum bullets to inflict devastating injuries, looted and mutilated the dead, and routinely executed prisoners and wounded soldiers. While they approved of these efforts on some level, colonial administrators worried that the sensational nature of these stories might trigger unrest among the local African population already upset about late rains and rising prices. As a result, in late 1914 the Rhodesian government created a Native Affairs Department to try and control the flow of information. When that failed, it began routinely sending Native Commissioners out into the bush to try and convince African chiefs that this was a “White Man’s War” which would not affect them. Meanwhile, in French North and West Africa, newspapers not only routinely carried atrocity stories from the metropole, but also invoked the revolutionary principles of 1789 and talked about the need to defend the sacred soil of la Patrie. French journalists highlighted the loyalty of France’s own African subjects and made a point of demonizing Germany’s Ottoman allies as Islamic “Boches” who fought against Muslim brotherhood. To aid in this process, the French not only produced new newspapers like Akhbar al Harb in Algeria and El Hark in the Comoros, but also filtered and spread those foreign papers they felt would be most useful to their own war effort. In addition to print media, European propaganda machines also made grudging use of film to sway public opinion. As the war began, French and British military authorities were reluctant to let cameramen on the front lines. Even when they finally relented, film production was subjected to a laborious censorship process that sanitized the bloodshed and violence of war. The bulk of shorts, newsreels, and documentaries produced focused primarily on the Western Front, with a heavy emphasis on factual and dispassionate accounts that eschewed the hysteria, hate propaganda, and atrocity stories so prevalent in the press. Africa and Africans were not well represented in these WWI films because they usually lay beyond the reach of official film-making efforts. Nevertheless, metropolitan French and British firms like Pathé, Gaumont Graphic, and the Tropical Film Company produced a handful of films showing the work of the South African Native Labor Corps in France, as well as the deployment of colonial troops in North Africa and Marseille. Other films and newsreel footage reinforced notions of imperial unity by showing ANZAC troops in the Egyptian campaign and South African politicians receiving imperial honors or speaking in favor of the British war effort. The French ultimately sent some of these films to French West Africa as part of traveling cinema shows to boost recruitment and generate local support for their war effort. Film-making in Africa itself focused exclusively on the campaign in East Africa and was largely the work of independent cameramen like Walther Dobbertin (1882-1961) and wildlife film-maker Cherry Kearton (1871-1940), who filmed German and British forces, respectively. The South Africa-based African Film Productions, which was created in 1914 to make feature films and publicity shorts for government and business, also sent a cameraman to film the participation of South African troops in the East Africa campaign. These efforts led to films like With Our Boys in German East and the 1920 compilation South Africa in the World War. Kearton’s Operations of the British Expeditionary Forces in East Africa: Our Grip on the Huns showed the King’s African Rifles on patrol and alternately highlighted the modern military hardware of British forces with the improvisation and backwoods skills needed to fight in Africa. Images of humans were heavily overshadowed by footage of animals and the countryside, hence the message conveyed emphasized the need to subdue the landscape as much as the Germans. As intended, these images of African savagery terrified German troops and prompted Berlin to unleash its own propaganda campaign denouncing the use of colonial troops in Europe. To that end, the German press described French Tirailleurs as primitive devils, vermin, and an undisciplined rabble who practiced cannibalism, used illegal weapons like bush knives for hand-to-hand combat, summarily executed POWs, and mutilated corpses. German illustrators produced all kinds of images showing Tirailleurs committing atrocities like taking German ears and collecting enemy heads as souvenirs. One of the most famous is a caricature entitled La Moisson de Boudou-Badabou (Boudou-Badabou’s harvest) in which a bloodthirsty Tirailleur with a knife in his teeth holds a severed German head dripping with blood. An equally evocative caricature appeared on the cover of the July 1916 issue of Kladderadatsch, which featured a bare-chested Tirailleur in the trenches, complete with exaggerated lips, nose ring, fetish necklace, and a skull on a thong slung over his shoulder. In the summer of 1915, German authorities supplemented these visuals by publishing an official pamphlet entitled Employment, Contrary to International Law, of Coloured Troops upon the European Theatre of War by England and France which repeated atrocity stories and, foreshadowing post-war claims about Die Schwarze Schande [the black shame], alleged that Senegalese soldiers sexually assaulted white women under their control. The pamphlet also complained that colonial soldiers imported savage methods of warfare to civilized Europe. More importantly, it argued that their deployment on the Western Front was contrary to international law and would undermine colonialism by destroying African belief in white superiority through exposure to weapons training and the spectacle of European nations fighting one another. The Germans argued that this was thus a violation of white solidarity and a betrayal of the colonial endeavor. Since depictions of African ferocity, regardless of who created them, threatened to make French civilians frightened of the Tirailleurs stationed in their midst, starting in late 1915, French propagandists began working to soften their image. Rather than brutal savages, Tirailleurs were now depicted as loyal, brave, childlike innocents under the complete control of their white officers and who therefore only posed a threat to the enemies of France. The new image of Tirailleurs, which appeared in the French press constantly, stressed their common Gallic identity and argued that they wanted to prove their gratitude for assimilation by fighting for France. Journals like the Annales Coloniales, the Revue des Troupes Coloniales, and the Revue du Monde Musulman reprinted letters from North and West African soldiers for propaganda purposes to convey their loyalty and the success of the French colonial doctrine of Assimilation. In addition, starting in January 1916, La Dépêche Coloniale ran a series of articles in which colonial experts attempted to dispel popular misconceptions and set the record straight regarding France’s African subjects. These articles sang their praises, talked about their social evolution, their loyalty to France, and highlighted their military attributes. Simultaneously, the national weekly l’Illustration ran articles which spoke of African contributions to the war and sought to humanize the Tirailleurs by showing them at rest, washing clothes, fishing, and listening to gramophones. Visual images underwent a similar transformation, in which depictions of Tirailleurs went from bloodthirsty brutes to naive, sexless, childlike savages who posed no danger to the metropole or the colonial order. One of the more noteworthy examples of this new imagery was an etching in the January 1915 issue of l’Illustration, which portrayed two white nurses giving a present to a beaming, wounded Tirailleur. His exaggerated pleasure in his gift and use of the pidgin French phrase “Y a bon” [It’s good] infantilized him and rendered him less threatening to French civilians. Both the catchphrase and the larger motif of childish naiveté were repeated in the famous and often replicated 1915 advertisement for the Banania breakfast drink, which featured a smiling Tirailleur seated on a crate, spooning his drink from a tin cup with childish glee. 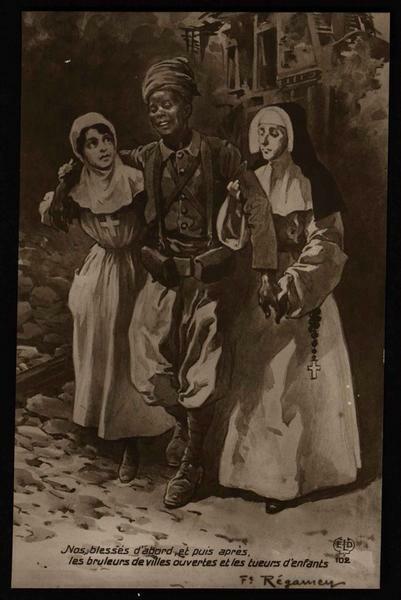 French illustrators also worked hard to depict colonial unity, either by showcasing the variety of colonial soldiers who answered the call to defend la Patrie or by referring to them as equals, as in the Frédéric Régamey (1849-1925) postcard depicting a nurse and nun helping a wounded Tirailleur walk over the caption “Our wounded first, and then the killers of children and arsonists of open villages.” Those sentiments were also conveyed in the publicity posters for the Journée de l’Armée d’Afrique et des Troupes Coloniales [African Army and Colonial Troops Day] that the French scheduled for June 1917 to instill imperial unity and raise money to support the needs of African battalions. The poster shows a heroic Tirailleur with his gun above his head exhorting his colleagues to follow him as he leads an attack on a German position. Dueling images of alleged African barbarity soon led the British, French, and Germans to indulge in propaganda regarding alleged atrocities committed in Africa prior to and during the war. The goal of these new allegations was to discredit the enemy as a colonial power and lay the groundwork for the post-war redistribution of African territories. As a result, the bulk of this propaganda was meant for domestic consumption but, as with earlier campaigns, it also soon found its way to Africa. The Germans used stories about the mistreatment of colonized peoples under French and British rule as a central feature of their propaganda in the form of articles in both the German and international press. In particular, they claimed that the Entente powers engaged in exploitation, cruelty, and injustice in their colonial possessions. Starting in January 1915, the Germans also began arguing that Entente forces in Africa were humiliating interned civilians and prisoners of war by placing them under guard by colonial troops, making them do hard labor without adequate protection from the sun, and subjecting them to poor living conditions. The German press also spoke about the destruction of property and the brutalization of missionaries and settlers in their colonies by Entente forces. These claims were soon supplemented by a series of official pamphlets which also leveled charges that African soldiers in the British forces murdered captured Germans and mutilated the dead for trophies. British propagandists soon retaliated in kind with a series of Blue Books that sought to debunk the German claims whilst simultaneously proving systemic brutality and mistreatment of native peoples in the German colonies. In 1915, the British issued their Correspondence Relative to the Alleged Ill-Treatment of German Subjects Captured in Cameroon to refute charges that deported civilians had been mistreated. This was followed in spring 1916 with a series of British attacks in the form of an unofficial commission that leaked its report to a newspaper in Natal. The report claimed that British prisoners of war during the Southwest Africa campaign had been mistreated before liberation by being forced to parade half-naked in front of African women, were starved, and were crowded into unsanitary cells. The British Colonial Office issued additional Blue Books in the summer of 1916 and fall of 1918, repeating allegations of atrocities and German misconduct in East and Southwest Africa in the hopes of stripping Germany of her colonies at war’s end. British charges against German forces in Africa included barbarity in war, such as mutilation of the dead and the use of prohibited weapons like dum dum bullets, the mistreatment of civilian prisoners, and cruelty to Africans, culminating in the supposed massacre of 200,000 natives in German East Africa. Stories like these were picked up and reprinted in editorials in the Times which asserted that the Germans’ treatment of Africans was worse than any atrocities they had committed in Europe. Not to be outdone by their British allies, the French published a series of articles between November 1918 and January 1919 in the Journal Officiel de la République Française comparing the poor treatment of natives in German Africa to their counterparts in French possessions, arguing that the former were cruel, unjust, and routinely made use of forced labor. Just as they had with the British claims, German propagandists worked hard for the remainder of the war to debunk these assertions in the international press whilst repeating their own counterclaims, which they argued rendered the Entente powers unfit to govern colonies. While Africans had access to stories about atrocities in Belgium, changing images of African troops serving in Europe, and allegations about pre-war and wartime atrocities committed in Africa, they were never the primary intended audience for those propaganda efforts. The official propaganda machines of both the Entente and Central Powers did, however, directly target African Muslims early in the war. The Germans had long cultivated a pro-Muslim image and used their alliance with the Ottomans to portray themselves as champions of Islam. As soon as the war broke out, both the Germans and Ottomans developed propaganda campaigns designed to reach African Muslims in hopes of triggering anti-colonial revolts in French North Africa, Italian Libya, and British Sudan. The bulk of these efforts consisted of committees and agencies located in the metropole, including the Berlin-based Nachrichtenstelle für der Orient (News Service for the Orient), which used German academics and defectors from French North Africa like Muhammed Salih al-Sharif al-Tunisi (1866-1921) and Rabah Boukaboubya (1875-?) to generate and translate propaganda leaflets into English, French, Arabic, and various Berber dialects. These leaflets, which were air dropped on North African troops in Europe and smuggled into British and French West Africa, described the Central Powers as the true defenders of Islam, invoked jihad, and called on Muslim soldiers in Entente armies to desert. Similar messages were spread among Muslim prisoners of war in special camps outside of Berlin in hopes that they would defect and join the Ottoman army fighting on the Mesopotamian Front. Official German efforts were supplemented in 1916 by the creation of the Berlin-based Committee for Algerian-Tunisian Independence, which sought to publicize colonial grievances. Meanwhile, North African exiles founded the Revue du Maghreb in Geneva, while the Ottomans established an International Muslim Office in Lausanne to spread propaganda in Muslim communities through a series of French and Arabic language publications, including ‘ālam al Islam, Le Devoir, Al-‘adl, -Harb al-àlam and Al Dschihad. Each of these publications celebrated German might and claimed that Berlin was the true champion of an Islam under attack by the Entente powers. They publicized Germany’s alliance with the Ottoman Empire, depicted Wilhelm II, German Emperor (1859-1941) as Hajj Wilhelm who would lead a jihad to expel the French infidels from the Middle East and North Africa, and called for Islamic unity against the Entente Powers. Although primarily designed for expatriates and colonial soldiers serving in Europe, the pro-Muslim propaganda generated by the Central Powers was also deliberately exported to Africa in hopes of swaying local populations into rebellion. Some of these materials were created for purely local consumption. For example, in fall 1914, the French seized German-produced tracts in Morocco and Oran that recounted an epic poem in both French and Arabic about an anti-French jihad which was to be led by Abd el Malek (?-1924), aka Abdul Malek, son of the 19th-century anti-colonial resistance fighter Abd el-Kader (1808-1883). The Germans later provided Abd el Malek with money and sent him to Morocco, accompanied by German advisors, to aid local dissidents and possibly raise a rebellion. Similarly, the Germans sent French- and Arabic-language texts to North Africa proclaiming that Emir Khaled el-Hasani ben Hachemi of Syria (1875-1936) would soon come to Algeria via airplane or zeppelin and, with the help of his friend the Kaiser, would raise a powerful army of liberation. German propagandists also made a point of publicizing the Ottoman declaration of jihad and handed out a stock of green flags emblazoned with the crescent and star in hopes recruiting soldiers among the Arab population of eastern Sudan. In West Africa, the Germans smuggled in Arabic letters to Muslim emirates in northern Nigeria claiming that Germany was not only fighting to prevent the seizure of Constantinople by infidels, but was also winning the war. Letters to the Fulani population in Nigeria argued that the British intended to seize all their land and prevent them from praying. They called on the Fulani to join the German side in the war as an act of self-defense and promised that those who did not would be punished when the Germans eventually took over Nigeria. These efforts were supplemented in May 1915 when a cross-border raid launched from neighboring Cameroon into Muri province left behind thousands of leaflets in Arabic calling on locals to declare jihad against the Entente powers. While German propaganda efforts never had much effect in Nigeria, the British were concerned enough to begin publishing the Gazette Extraordinary, which explained that Britain had championed Turkish independence since 1878 and was actively supported by Muslim rulers like Sir Sultan Mohammed Shah, Aga Khan III (1877-1957) and Sultan Khalifa II bin Harub of Zanzibar (1879-1960). Governor Frederick Lugard (1858-1945) later distributed Arabic translations of a message from the Aga Khan all over northern Nigeria proclaiming that the British were no threat to Muslims and that the Turks were not fighting to defend Islam. These efforts soon paid off, as Nigerian emirs began sending donations and letters of support as proof of their loyalty to Britain. Shortly thereafter, British officials in Nigeria distributed posters all over the region to help publicize Husayn ibn Ali, King of Hejaz (c.1853-1931) and Sharif of Mecca's decision to rise up in revolt, declare Arabic independence, and proclaim himself the guardian of Islam. Their goal was to highlight that the Turks were “no longer the spiritual head of the Islamic world” and therefore were not deserving of support. The French were just as active as their British counterparts in generating pro-Muslim propaganda. In early November 1914, they created the Paris-based Comité interministériel des affaires musulmanes (CIAM) and tasked it with generating propaganda to persuade North Africans that France was a supporter of Islam whilst also countering the German-Ottoman campaign to stir up rebellion in the colonies. These efforts bore fruit in the form of elicited statements from Sultan Moulay Youssef of Morocco (1881-1927), the Majils al-baladi (municipal council) of Fez, Islamic scholars, and leaders of local Sufi brotherhoods, including the Shurafa Ahmed ben el-Hassani of Wazzan (n.d.), and Abd al-Qadir ibn Muhammed Sharqawi (n.d.), which proclaimed that France not only provided peace and security for Muslims, but also respected Islam and its traditions. By contrast, they argued, the Ottomans were oppressors who never did anything to improve the lives of Muslims and were ultimately responsible for the decline of Islam. As such, they exhorted Muslims to join forces with the Entente powers in a fight against the enemies of humanity. To eliminate any stigma in bearing arms against the Ottoman Sultan, some of these scholars made use of the Koran, the Hadith, and Arabic poetry to deny his legitimacy as Khalifa on the grounds that he was not a descendent of Muhammed. Similar efforts took place in French West Africa (AOF) where Governor-General Marie-François Joseph Clozel (1860-1918) ingratiated himself to Muslim chiefs. During the summer of 1916, several dozen religious heads from AOF and the Maghreb met with Husayn ibn Ali, the Sharif of Mecca, in a bid to convince him to fight the Ottomans. These delegates were accompanied by General Édouard Brémond (1868-1948), chief of the French mission in Hejaz, and Chérif Cadi (1867-1939), a naturalized Algerian, who brought a letter of friendship from President Raymond Poincaré (1860-1934). Meanwhile, French recruiters in the colonies began dispatching public criers to small towns and local markets to solicit volunteers and publicize French efforts to accommodate the needs of Muslim soldiers by providing appropriate food, prayer rooms, and makeshift mosques. The French soon supplemented this with radio broadcasts and articles in government-controlled newspapers like Morocco’s Akhbar al-Maghrib and al-Saada, which sought to debunk German propaganda claims and prove that France was a friend of Islam. To that end, the CIAM built two hostels for pilgrims in Mecca and Medina and began organizing the Hajj for notables from AOF and North Africa. The ongoing need for recruits soon led the Entente powers to explicitly direct their propaganda efforts at non-Muslim Africans in hopes of inducing them to enlist. In Nyasaland, the British government widely publicized the threat from nearby German East Africa in an effort to boost enrollment. Government officials and local chiefs convened mass meetings where they told those present that, if the Germans took Nyasaland, they would seize all the land and kill or enslave the locals. Similarly, Igbo men in Nigeria were told that they had to go fight the Germans in Cameroon to keep them from coming to Nigeria and burning it. Those chiefs and emirs who supported the war effort were publically recognized with salutes and the presentation of ceremonial staffs during Empire Day celebrations. In South Africa, recruiters seeking men to serve in France as part of the South African Native Labour Corps (SANLC) routinely painted lurid pictures of the coming oppression, cruelty, and slavery if Britain lost the war and the Germans took over instead. The Cape government also held a series of special meetings where African and British dignitaries addressed the crowd in speeches stressing loyalty, patriotism, and the material benefits of service in the form of good food, pay, clothes, and the educational opportunities inherent in overseas service. At the end of 1917, the South African government published a pamphlet by Francis Zaccheus Santiago Peregrino (1851-1919) called His Majesty’s Black Labourers: A Treatise on the Camp Life of the South African Native Labour Corps in hopes that it would drum up more recruits by promoting the conditions in France. Peregrino echoed local black newspapers, which argued that service in the SANLC would give Africans recognition as subjects of the crown and bolster demands for better treatment, while simultaneously counseling that if they failed to step up they would be displaced by Asians and would thus forfeit the opportunity to prove their manliness. The South African government also used letters from Africans at the front for propaganda purposes, censoring them heavily to portray good conditions in France. These letters were then widely distributed in African communities in the vain hope they would prove more persuasive than official propaganda. When that initiative failed, the government opted to demobilize twenty carefully selected SANLC veterans and sent them home to organize meetings where they told stories of African loyalty and contentment with their service abroad. Some also extolled the entertainment possibilities in France, the local food, and the chance to date women on their own initiative. Others created the impression that the work required of them was easy, relaxed, and well paid. As an additional inducement to recruit laborers, the government also began offering signing bonuses, tried to appease potentially unruly groups with concessions, and used inter-tribal rivalries to generate a spirit of competition in regards to recruitment statistics. The French employed similar tactics and propaganda messages to facilitate recruitment in their colonies. Starting as early as 1914, colonial administrators in French Africa sent paid native recruiting agents, native police, and even missionaries to harangue the local population into supporting the war effort against “Turko-German barbarities” and attacks on the French motherland. In the process, they made the case that the German attacks in the metropole were attacks on the nation as a whole, including French colonies. Furthermore, they argued that the Germans wanted to seize colonies for farmland and to exploit African labor, hyped atrocity stories about the unjust “Boche” who was determined to impose slavery, and argued that the Germans would savagely mistreat Africans. As proof, they claimed that the populations of Togo and Cameroon celebrated when French forces arrived to take over from the Germans. Meanwhile, the French described themselves, by contrast, as liberators with a history of ending slavery, freeing locals from African tyrants like Umar Tal (1797-1864), and introducing peace, justice, and progress. They also pointed to the handful of high-ranking African officials as proof that France rewarded loyal colonial subjects with responsibility, and publicized the many potential material incentives serving France provided, including exemptions from the Indigènat and prestation, recruitment bonuses, family allowances, and extra access to schools and clinics. The drop off in enlistments as the war dragged on and mounting casualties led the French to redouble their propaganda campaign aimed at potential recruits. Starting in 1916, the colonial regime in Dakar began organizing enlistment celebrations where they issued medals to volunteers and promoted both the prestige of wearing a uniform and the material benefits it afforded its wearer. Later in the war, Governor-General Gabriel Louis Angoulvant (1872-1932) ordered recruiters to put volunteers into uniform as soon as possible so as to maximize their visual effect on the civilian population. He then organized native festivals as recruits left home and when they arrived in training camps to project confidence and to honor their loyalty and service. The crowning achievement of French recruitment propaganda came with Blaise Diagne’s (1872-1934) mission to West Africa. Diagne, the first African elected to the French National Assembly, was appointed Commissaire Generale for native recruitment in late 1917. In order to better carry out his commission, he returned to Senegal in February 1918, accompanied by a large entourage that included three African officers, local political figures, and two white administrators. On arrival he called a meeting of local African notables in Dakar, including Muslim elites and provincial chiefs, to explain his mission and solicit their support by creating the impression that he was consulting them. During that meeting, he also arranged for several of their sons to be promoted to non-commissioned officers or 2nd lieutenants. Once he had the support of the Senegalese notables, Diagne left on a six-month propaganda and recruitment tour through French West Africa with a carefully selected entourage designed to send a powerful message of national unity. The entire process was carefully and deliberately stage managed. Not only was his entourage surrounded by the pomp befitting a high-level government official, but it also included a group of highly decorated African officers and NCOs to show that service in the army could lead to upward mobility. As further proof, he insisted that Africans in his entourage get the same perks as Europeans, including first-class seats on trains and accommodation in official residences during his tour. In addition to highlighting the existence of African officers and NCOs, Diagne also arranged the furlough of 400 Tirailleurs and used them as propaganda tools to impress locals and prove that service in the army was not a death sentence. Everywhere he went, Diagne called public meetings where he began by honoring local notables and chiefs via presentations of medals, cash awards, and temporary promotions. Flanked by his entourage, including the furloughed Tirailleurs in their uniforms, Diagne told the gathered audience about the prestige Africans got from military service, stressed its egalitarian nature, talked about how he got concessions from the French for African recruits in the form of enlistment bonus and monthly family allowances, and how this all marked the start of a new era in French colonial policy that would lead to a more equitable and just future for Africans. At the same time, he also used crude caricatures to incite hatred for the “Boche” and love of France, and repeated the message that a German victory would relegate those in the audience to a future filled with brutality and oppression. Diagne’s efforts proved highly effective. Not only did resistance to recruitment diminish, but the numbers of volunteers rose and quickly exceeded expectations, culminating in the enlistment of nearly 80,000 additional men. While metropolitan propaganda predominated, settler populations and local African communities in the colonies also engaged in their own propaganda activities. News of the war led to a burst of jingoism and mass demonstrations among the white populations of Kenya, Rhodesia, and South Africa. This took the form of parades, pro-war rallies, and meetings to explain the war and what it meant for the settlement colonies. Audience members were encouraged to publically and proudly declare their patriotism, vent anti-German sentiments, and sing the national anthem. Meanwhile, the Union Jack and Entente flags were prominently displayed on important buildings and in advertisements for goods ranging from agricultural supplies to recordings of speeches, poems, and songs about the war. The local entertainment industry also got involved in spreading pro-war propaganda. In addition to feature films like mysteries and comedies, cinemas also showed documentaries, newsreels, and war dramas like Sarah Bernhardt’s (1844-1923) Mothers of France. Music hall and concerts provided a steady diet of musical revues and popular war songs, including “Laddie in Khaki,” “Who Killed Kaiser Bill?” and a modified version of “It’s a long Way to Tipperary” with new lyrics to fit the local situation in Africa. Similarly, Cape municipalities often directed local orchestras to play the Belgian and Russian anthems, while Anglican choirs took up the Marseillaise. Churches across British and French Africa also played a role in propaganda efforts. Priests and pastors routinely incorporated war propaganda into their sermons, condemning alleged German barbarity and describing the conflict as a holy war against the rapacious and destructive Huns in which parishioners were duty bound to enlist or, at the very least, to donate to war relief funds. In Nigeria, the Anglican Bishop Isaac Oluwole (1852-1932) gave a sermon in Lagos on 6 January 1918 in which he lauded Britain as a defender of freedom and justice, whilst reminding his audience that they received blessings and privileges as British subjects that would be stripped away in the event of a German victory. Similar anti-German and pro-French statements were made in French West Africa by bishops and Muslim leaders like Shaikh Sidiyya of Mauretania (1862-1923). French missionaries in Senegal also deliberately decorated their chapels with the French flag to boost a sense of imperial unity and patriotism among their flock. In South Africa and Rhodesia, local elites saw the war and participation in propaganda activities as an opportunity to promote their own interests. In late 1915, westernized, mission-educated local elites in Southern Rhodesia formed the Loyal Mandebele Patriotic Society (LMPS). Eager to impose its patriarchal and puritanical views on other Africans, the LMPS curried favor by openly expressing solidarity with British war aims. It also made use of patriotic language interspersed with occasional African symbols and local history, such as depictions of Mzilikazi (1790-1868), to encourage the inhabitants of cities like Bulawayo to report crime and crack down on prostitution. Similarly, Shona and Ndbele chiefs called on their people to contribute to war relief funds, less in support of the war than in the belief that participating in symbols of imperial unity could later be parlayed into an expansion of political rights. That approach was also employed by South African elites like Abdullah Abdurahman (1872-1940), head of the African People’s Organization, who participated in a series of pro-war events during which he called on audiences to put aside their domestic grievances and rally to the British cause in hopes of securing recognition and concessions. He and his peers capitalized on existing British propaganda that argued that the Entente powers were fighting for the rights and freedoms of oppressed nationalities in Europe, and linked it to their own demands for an end to racial discrimination, wider voting rights, and more inclusivity in South Africa. Despite being routinely overlooked in studies of the Great War, the African theaters were witness to both considerable fighting and extensive and hitherto largely overlooked propaganda initiatives. As such, they provide an important opportunity to deepen our understanding of how the various belligerents sought to mobilize public opinion in support of what was a truly global conflict. While much of these efforts made use of tropes created in Europe for consumption by a metropolitan audience, African propagandists – both white and black – also played key roles in helping to sell the White Man’s war to colonial subjects. Their efforts provide us with an all too rare glimpse of African agency in the midst of the colonial endeavor. ↑ Badsey, Stephen and Taylor, Philip: The Experience of Manipulation. Propaganda in Press and Radio, in: Liddle, Peter and Whitehead, Ian (eds. ): The Great World War 1914-1945. Vol. 2 The People’s Experience, London 2001, pp. 41-56, here p. 50; Welch, David: Germany, Propaganda and Total War, 1914-1918. The Sins of Omission, New Brunswick, NJ 2001; Demm, Eberhard: Propaganda and Caricature in the First World War, in: Journal of Contemporary History 28/1 (1993), pp. 163-192, here 165-167; Véray, Laurent: 1914-1918, The First Media War of the Twentieth Century. The Example of French Newsreels, in: Film History 22/4 (2010), pp. 408-425, here p. 412; Reeves, Nicholas: Official British Film Propaganda During the First World War, London 1986, pp. 9-12; Ridel, Charles: Propaganda at Home (France), Issued by 1914-1918-online, online: DOI: http://dx.doi.org/10.15463/ie1418.10359 (retrieved 14 June, 2015); Ther, Vanessa: Propaganda at Home (Germany), Issued by 1914-1918-online, online: DOI: http://dx.doi.org/10.15463/ie1418.10488 (retrieved 14 June, 2015). ↑ Winter, J. M.: “Propaganda and the Mobilization of Consent” in Strachan, Hew (ed. ): The Oxford Illustrated History of the First World War, Oxford 1998, pp. 216-226, here pp. 217-219; Horne, John and Kramer, Alan: German Atrocities, 1914. A History of Denial, New Haven 2001; Gullace, Nicoletta: Allied Propaganda and World War I. Inter-war Legacies, Media Studies, and the Politics of War Guilt, in: History Compass, 9/9 (2011), pp. 686-700. Welch, Germany 2001; Fox, Jo: Atrocity Propaganda, issued by British Library, online http://www.bl.uk/world-war-one/articles/atrocity-propaganda (retrieved 15 June 2015). ↑ Committee on Alleged German Outrages, Report of the Committee on Alleged German Outrages, London 1915. ↑ Samson, Anne: South Africa and the First World War, in: Paddock, Troy (ed. ): World War I and Propaganda, Leiden 2014, pp. 113-133, here 115, 118, 126-127; Grundlingh, Albert: Fighting their own War. South African Blacks and the First World War, Johannesburg 1987, p. 21. ↑ Greenstein, Lewis J: The Nandi Experience in the First World War, in Page, Melvine (ed. ): Africa and the First World War, New York 1987, pp. 81-94, here p. 82. ↑ Clarke, Peter: West Africans at War 1914-18, 1939-45. Colonial Propaganda and its Cultural Aftermath, London 1986, pp. 25-27, 30; Omu, Fred: The Nigerian Press and the Great War, in: Nigeria Magazine 96 (1968), pp. 44-49, here pp. 45-46; Osuntokun, Akinjide: Nigeria in the First World War. Atlantic Highlands, NJ 1979, pp. 67-71, 78-79; Thobie, Jacques et al: Histoire de la France Coloniale. Volume 2 1914-1990, Paris 1990, p. 79. ↑ McLaughlin, Peter: Ragtime Soldiers. The Rhodesian Experience in the First World War, Bulawayo 1980, pp. 1-5, 81-82. ↑ Samson, South Africa, 2014, pp. 120-122. ↑ Stapleton, Tim: Views of the First World War in Southern Rhodesia (Zimbabwe) 1914-1918, in: War and Society 20/1 (2002), pp. 23-45, here p. 27; McLaughlin, Ragtime Soldiers 1980, pp. 36-37. ↑ Stapleton, Views 2002, 37; Stapleton, Tim: No Insignificant Part. The Rhodesia Native Regiment and the East Africa Campaign of the First World War, Waterloo, Ontario 2006, pp. 23-26. ↑ Thobie et al, Histoire, 1990, p. 79. ↑ Sorlin, Pierre: France. The Silent Memory, in: Michael Paris (ed. ): The First World War and Popular Cinema. 1914 to the Present, New Brunswick, NJ 2000, pp. 115-137; here pp. 120-121; Sorlin, Pierre: The French Newsreels of the First World War, in: Historical Journal of Film, Radio and Television 24/4 (2004), pp. 507-515; Reeves, Nicholas: Official British Film Propaganda, in: Paris, First World War 2000, pp. 27-50, here pp. 29-35. Also see Reeves, Official 1986, pp. 14-23. ↑ Haggith, Toby and Smith, Richard: Sons of Our Empire. Shifting Ideas of ‘Race’ and Cinematic Representation of Imperial Troops in World War I, in: Lee Grieveson and Colin McCabe (eds. ): Empire and Film, London 2001, pp. 35-53, here pp. 38-39, 46; Roberts, Andrew: Africa on Film to 1940, in History in Africa 14 (1987), pp. 189-227, here pp. 194-195, online: http://www.jstor.org/stable/3171838 (retrieved: 12 January 2017). ↑ Thobie et al, Histoire 1990, p. 79. ↑ Haggith and Smith, Sons 2001, pp. 38-39, 46, 48; Roberts, Africa 1987, pp. 194-195. ↑ Lunn, Joe: Memoirs of the Maelstrom. A Senegalese Oral History of the First World War, Portsmouth, NH 1999, p. 120; Koller, Christian: The Recruitment of Colonial Troops in Africa and Asia and their Deployment in Europe During the First World War, in: Immigrants and Minorities 26/1 (2008), pp. 111-133, here pp. 124-126; Dine, Philip: The French Empire, in: Liddle and Whitehead (eds. ): Great World War 2001, pp. 275-290, here p. 281; Echenberg, Myron: Colonial Conscripts. The Tirailleurs Sénégalais in French West Africa, 1857-1960, Portsmouth, NH 1991, pp. 32-33. ↑ Koller, Christian: Representing Otherness. African, Indian and European Soldiers, Letters and Memoirs, in: Santanu Das (ed. ): Race, Empire and First World War Writing, Cambridge 2011, pp. 127-142, here p. 132. ↑ Michel, Marc: L’Appel à l’Afrique: Contributions et réactions à l’effort de Guerre en AOF (1914-1918), Paris 1982, pp. 540-542. ↑ Olusoga, David: The World’s War. London 2014, p. 180. ↑ Reeves, Official 1986, pp. 136-139; Koller, Recruitment 2008, pp. 123-124; Echenberg, Colonial 1991, pp. 32-33. ↑ Gervereau, Laurent: De bien trop noirs desseins, in: Riesz, János and Schultz, Joachim (eds. ): ‘Tirailleurs Sénégalais’ Zur Bildlichen und Literarischen Darstellung Afrikanischer Soldaten im Dienste Frankreichs - Présentations Littéraires et figuratives de soldats Africains au service de la France, Frankfurt am Main 1989, pp. 111-131, here pp. 112 and 120. ↑ La Moisson de Boudou-Badabou, unknown artist, in private collection of author. ↑ Gaillard, Emmanuelle: Le siècle de la Presse, issued by L’histoire par l’image, online http://www.histoire-image.org/pleincadre/index.php?i=929 (retrieved 15 June 2015). ↑ Koller: Representing 2011, pp. 128-131; Ginio, Ruth: French Officers, African Officers, and the Violent Image of African Colonial Soldiers, in: Historical Reflections 36/2 (2010), pp. 59-75, here p. 66; Dine, The French Empire 2001, p. 281; Olusoga, World’s War 2014, pp. 185-187. ↑ Lunn, Joe: Remembering the ‘Tirailleurs Sénégalais’ and the Great War. Oral History as a Methodology of Inclusion in French Colonial Studies, in: French Colonial History 10 (2009), pp. 125-149, here pp. 127-128, online: http://www.jstor.org/stable/41935196; (retrieved: 12 January 2017); Koller, Recruitment 2008, pp. 124-126. ↑ Ginio, French officers 2010, pp. 65-66; Koller, Representing, 2011, p. 135; Revue du Monde Musulman: Honour to the Flag. French Musulman’s Testimonies of Loyalty, Paris 1916. ↑ Lunn, Memoirs 1999, pp. 124, 158-159. ↑ Dine, French Empire, 2001, p. 281. ↑ Fell, Alison: Nursing the Other: The Representation of Colonial Troops in French and British First World War Nursing Memoirs, in Das (ed): Race, 2011, pp. 158-174, here p. 161. ↑ Gervereau, De bien trop, 1989, p. 125; Ginio, French Officers, 2010, p. 65. ↑ Gervereau, De bien trop 1989, p. 112; Régamey, Frédéric. Nos blessés d’abord, issued by French Government, online: http://www.culture.gouv.fr/Wave/image/joconde/0694/m033305 _023428_p.jpg (retrieved: 15 June 2015). ↑ Koller, Recruitment 2008, pp. 126. ↑ Read, James Morgan: Atrocity Propaganda 1914-1919, New York 1972, pp. 123-124; Clarke, West Africans 1986, pp. 32-34. ↑ Steuer, Kenneth: German Propaganda and Prisoners of War During World War I, in: Paddock, Troy (ed. ): World War I, 2001, pp. 155-180, here p. 165. ↑ Reichs-Kolonialamt: Das Verhalten der Englischen und der unter englischem oberbefehl stehenden französischen Truppen gegen die weisse Bevölkerung Kamerun und Togo, Berlin 1916; Reichs-Kolonialamt: Die Kolonialdeutschen aus Kamerun und Togo in französischer Gefangenschaft, Berlin: Reischsdruckerei, 1917; and Reichs-Kolonialamt, Die Kolonialdeutschen aus Deutch Ost-Afrika in belgischer Gefangenschaft, Berlin 1918. ↑ Colonial Office: Correspondence Relative to the Alleged Ill-Treatment of German Subjects Captured in Cameroon, London 1915. ↑ Reeves, Official 1986, p. 235. ↑ Colonial Office, Papers Relating to German Atrocities and Breaches of the Rules of War in Africa, London 1916; Union of South Africa, Report on the Natives of South Africa and their Treatment by Germany, London 1918. ↑ Reeves, Official 1986, p. 236. ↑ Clarke, West Africans 1986, pp. 32-34. ↑ Killingray, David: The War in Africa. in: Strachan, Oxford 1998, pp. 92-103, here pp. 94-95. ↑ Steuer, German Propaganda 2014, pp. 172-173; Clarke, West Africans 1986, p. 18; Killingray, War in Africa 1998, pp. 94-95; Dine, French Empire 2001, p. 280; Norris, Ted: German Attempts to Incite Insurgency among the Muslims of the French and British Colonies during the First World War. The Case of the Campaign in West Africa, Berlin 1990, pp. 18-22; Maghraoui, Driss: The ‘grande guerre sainte’: Moroccan Colonial Troops and Workers in the First World War, in: Journal of North African History 9/1 (2004), pp. 1-21, here pp. 10-11. ↑ Fogarty, Richard: Out of North Africa. Contested Visions of French Muslim Soldiers During World War I, in: Andrew Jarboe and Richard Fogarty (eds. ): Empires in World War I. Shifting Frontiers and Imperial Dynamics in a Global Conflict, New York 2014, pp. 136-158, here pp. 142-143; Jones, Heather: Imperial Captivities: Colonial Prisoners of War in Germany and the Ottoman Empire, 1914-1918, in: Das, Race 2011, pp. 175-194, here p. 176; Steuer, German Propaganda 2014, pp. 174-175. ↑ Thobie et al., Histoire 1990, pp. 113-114. ↑ Ibid., p. 86; McMaster, Neil: Imperial Façades. Muslim Institutions and Propaganda in Inter-war Paris, in: Chafer, Tony and Sackur, Amanda (eds. ): Promoting the Colonial Idea: Propaganda and Visions of Empire in France, New York 2002, pp. 71-81, here p. 82. ↑ Clarke, West Africans 1986, p. 18. ↑ Thobie et al., Histoire 1990, pp. 86, 114. ↑ Osuntokun, Nigeria 1979, p. 149. ↑ Maghraoui, Grande guerre 2004, p. 15; McMaster, Imperial Facades 2002, p. 82; Thobie et al., Histoire 1990, p. 87. ↑ Maghraoui, Grande guerre 2004, pp. 12-16. ↑ Thobie et al., Histoire 1990, pp. 79-80. ↑ Maghraoui, Grande guerre 2004, pp. 8-9. ↑ Ibid. ; Fogarty, Out of North Africa, 2014, pp. 142-143. ↑ Thobie et al., Histoire 1990, p. 79; Michel, Marc: Les Africains et la Grande Guerre. l’appel à l’Afrique (1914-1918), Paris 2003, p. 52. ↑ Page, Melvin: The War of Thangata. Nyasaland and the East African Campaign, 1914-1918, in: Journal of African History 19/1 (1978), pp. 87-100, here p. 88. ↑ Matthews, James: Nwose’s Tale, in: Der Angriff: A Journal of World War I History, 15 (1981), pp. 8-11, here p. 8; Clarke, West Africans 1986, p. 29. ↑ Clarke, West Africans 1986, p. 6; Wilan, B. P: The South African Native Labour Contingent, 1916-1918, in: Journal of African History 19/1 (1978), pp. 61-86, here pp. 65-67, online: http://www.jstor.org/stable/180612 (retrieved: 12 January 2017). ↑ Nasson, War Opinion 1995, p. 269. ↑ Grundlingh, Fighting 1987, pp. 62-66. ↑ Antier, Chantal: Le recrutement dans l’empire colonial française, 1914-1918, in: Guerres mondiales et conflits contemporains 230/ 2 (2008), pp. 23-36, here p. 26, online: http://www.jstor.org/stable/25733296 (retrieved: 12 January 2017); Michel, L’Appel 1982, p. 249. ↑ Michel, L’Appel 1982, pp. 250-251. ↑ Michel, Les Africains 2003, p. 51; Antier, Recrutement 2008, p. 31. ↑ Thobie et al., Histoire 1990, p. 81; Michel, L’Appel 1982, pp. 82-83. ↑ Lunn, Memoirs 1999, pp. 76-78. ↑ Michel, Les Africains 2003, pp. 68-71; Antier, Recrutement 2008, p. 29. ↑ Lunn, Memoirs 1999, p. 81. ↑ Savage, Donald and Munro, J. Forbes Munro: Carrier Corps Recruitment in the British East Africa Protectorate, 1914-1918, in: Journal of African History 7/2 (1966), pp. 313-342, here p. 319; Thomas, Roger: Military Recruitment in the Gold Coast During the First World War, in: Cahiers d’Etudes Africaines 15/57 (1975), pp. 57-83, here p. 69; Nasson, War Opinion 1995, pp. 252-253; Stapleton, Views 2002, pp. 26-27; McLaughlin, Ragtime Soldiers 1980, p. 2. ↑ McLaughlin, Ragtime Soldiers 1980, pp. 128, 133-134; Nasson, War Opinion 1995, pp. 252-253. ↑ Moorhouse, Geoffrey: The Missionaries. Philadelphia 1973, pp.293-294; Nasson, War Opinion 1995, p. 254; McLaughlin, Ragtime Soldiers 1980, p. 86; Stapleton, Views of the First World War 2002, p. 43. ↑ Clarke, West Africans 1986, pp. 31-32. ↑ Foster, Elizabeth: Faith in Empire. Religion, Politics, and Colonial Rule in French Senegal, 1880-1940, Stanford 2013, p. 246. ↑ Stapleton, Views 2002, pp. 41-42; Stapleton, No Insignificant Part 2006, pp. 27-28. ↑ Nasson, Bill: Why they Fought: Black Cape Colonists and Imperial Wars, 1899-1918, in: International Journal of African Historical Studies 37/1 (2004), pp. 55-70, here pp. 59-60, online: http://www.jstor.org/stable/4129072 (retrieved: 12 January 2017). Fogarty, Richard: Out of north Africa. Contested visions of French Muslim soldiers during World War I, in: Jarboe, Andrew Tait / Fogarty, Richard (eds. ): Empires in World War I. Shifting frontiers and imperial dynamics in a global conflict, London; New York 2014: I. B. Tauris, pp. 136-158. Gervereau, Laurent: De bien trop noirs desseins, in: Riesz, János / Schultz, Joachim (eds. ): 'Tirailleurs sénégalais'. Zur bildlichen und literarischen Darstellung afrikanischer Soldaten im Dienste Frankreichs, Frankfurt a. M.; New York 1989: Lang, pp. 111-131. Ginio, Ruth: French officers, African officers, and the violent image of African colonial soldiers, in: Historical Reflections 36/2, 2010, pp. 59-75. Haggith, Toby / Smith, Richard: Sons of our empire. Shifting ideas of ‘race’ and cinematic representation of imperial troops in World War I, in: Grieveson, Lee / MacCabe, Colin (eds. ): Empire and film, London 2011: Palgrave Macmillan, pp. 35-53. McMaster, Neil: Imperial façades. Muslim institutions and propaganda in inter-war Paris, in: Chafer, Tony / Sackur, Amanda (eds. ): Promoting the colonial idea. Propaganda and visions of empire in France, Houndmills; New York 2002: Palgrave, pp. 71-81. Samson, Anne: South Africa and the First World War, in: Paddock, Troy R. E. (ed. ): World War I and propaganda, Leiden 2014: Brill, pp. 113-133. Stapleton, Tim: Views of the First World War in Southern Rhodesia (Zimbabwe) 1914-1918, in: War & Society 20/1, 2002, pp. 23-45. Steuer, Kenneth: German propaganda and prisoners of war during World War I, in: Paddock, Troy R. E. (ed. ): World War I and propaganda, Leiden 2014: Brill, pp. 155-180. Thobie, Jacques (ed. ): Histoire de la France coloniale. L'apogée, 1914-1990, volume 2, Paris 1990: Colin. Orosz, Kenneth J.: Propaganda in the Colonies (Africa) , in: 1914-1918-online. International Encyclopedia of the First World War, ed. by Ute Daniel, Peter Gatrell, Oliver Janz, Heather Jones, Jennifer Keene, Alan Kramer, and Bill Nasson, issued by Freie Universität Berlin, Berlin 2017-02-21. DOI: 10.15463/ie1418.11056.